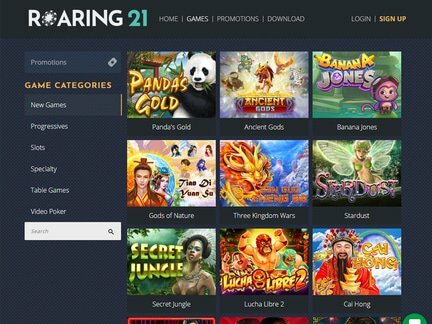 Roaring 21 Casino is a brand new RTG gambling site with some amazing bonus and promotions for all real money players. The Roaring 21 bonus for new players is a fabulous welcome package worth up to $4,300 plus 21 free spins. The bonus is spread out over your first three deposits at the casino. With your first deposit, you get a 100% match up to $1,000 plus 21 free spins. Your second deposit will get you a 120% match up to $1,200 and your third deposit is worth a whopping 210% up to $2,100. The welcome bonus is only available to new players and is subject to the casino's full terms and conditions. Keep in mind that this is not a no deposit bonus and you'll be required to make a minimum deposit. That's not all if slots aren't your thing you can choose a different welcome bonus. You can choose a 100% bonus up to $1,000 to play all other games. Wagering requirements and terms and conditions can be found on the Casino Roaring 21 promotions page so be sure to check them out. When it comes to regular promotions you'll be blown away by what this new casino has to offer. First off, there's a slots bonus where you can claim a 70% bonus on your deposit with wagering requirements of just 40x. This slots bonus can be claimed once per day and there is no coupon code required. If you prefer to play other games there's a special daily bonus for this too. You can get a 60% bonus when you redeem the special code in the coupon section and this can be used once every day with 40x wagering requirements. If free spins are your thing, you can claim the Free Spins Frenzy promo where you get a 65% slot bonus and 20 free spins on Big Blooper. Again, wagering requirements are 40x and you can redeem this bonus once per day. There is an unlimited continual bonus offer too that you can claim anytime you make a deposit. This will get you a 50% bonus. For those who like to deposit larger sums, there is the Bonus Maximizer promotion. The more you deposit the higher your percentage bonus. Wagering requirements are 40x and you can claim this once per day to play slots games. Cashback offers are available too and you can speak with the casino hosts who will review your account at any time for an instant 40% cashback on your losses. There are weekly special promotions where you can get 75 free spins using the special voucher code found on the promotions page. There's also a monthly special promo deal where you can get a 100% deposit match every month to play slots. Finally, there are special payment method bonuses too. You can a 75% Bitcoin special slots bonus, MasterCard Special 70% slots bonus, Gift Card special 75% instant gift card bonus, Extra Special 300% BTC booster Bonus, Extra Special 200% MasterCard Deposit bonus and Extra special 300% Instant Gift Card Bonus. These are all redeemable once per day. All players at Casino Roaring 21 can earn comp points too so there is never a dull moment. All the terms and conditions can be found on the casino website, so make sure to review them when choosing a promotion. This online casino is perfect for Canadian players and has a huge selection of games. There are some country restrictions and players from Australia, Austria, Belgium, Bulgaria, Costa Rica, Croatia, Curaçao, Cyprus, Czech Republic, Denmark, Estonia, Finland, France, Germany, Greece, Hungary, Ireland, Israel, Italy, Latvia, Lithuania, Luxembourg, Malta, Netherlands, Poland, Portugal, Romania, Russia, Slovakia, Slovenia, Spain, Sweden, and the United Kingdom are not permitted to play for real money or open an account. Roaring21 Casino is a brand new RTG casino. The software is excellent and is available in no download instant play making it compatible with all operating systems. Players can enjoy a good range of video slots, table games, and video poker titles. RTG has been around for almost twenty years and has a great deal of experience in the online gambling industry. Their software has won numerous awards over the years and they are ranked in the top five software providers in the world. All the games can be played on mobile devices like iPhone, iPad, and Android smartphones and tablets too. Games can be played for real money or in demo mode and when you visit the games category, you can choose from a number of different categories. Categories include New Games, Progressives, Slots, Specialty, Table Games, and Video Poker. The new games section includes titles such as Panda's Gold, Ancient Gods, Banana Jones, Gods of Nature, Stardust, and more. You can play all the games in no download on desktop and mobile iPad, iPhone and Android devices without having to download an app. The progressive jackpots section has six titles to choose from and you'll find information on these below in our jackpot section. The slots category is broken into a number of subcategories where you can choose from 3 reel games, 5 reel, 6 reel, bonus round, or progressive. There are five 3 reel titles to choose from. There are 101 titles to choose from in the 5 reel category including popular titles like Cleopatra's Gold, Coyote Cash, Bubble Bubble 2, Ronin, Penguin Power, and more. In the 6 reel section, there are four different titles to choose from. The Bonus round section had 39 different titles and all of these include excellent bonus features to help you get more wins too. The Specialty section is made up of Board Games, Keno & Bingo, Scratch Cards, and Table Games. There is only one board game and this is Banana Jones. There is one Keno game, one scratch card title, and three different table games. In the Table Games section players can choose from seven different 21 games and titles include Suit 'Em Up Blackjack, Face Up 21, Super 21, and more. There are thirteen different titles in all the table games category including Tri Card Poker, Blackjack, Vegas Three Card Rummy, European Blackjack, Baccarat, Pontoon, Pai Gow, Caribbean Stud, and more. Roulette fans will find roulette games in the table games section of the speciality category. The Video Poker category is broken up into 1 hand, 10 hands, 3 hands, and 52 hands. There are some great titles to choose from including Bonus Poker, Double Bonus Poker, Deuces Wild, Jacks or Better, and more. There are six different RTG progressive jackpots to choose from at Casino Roaring21. These are Aztec's Millions, Megasaur, Let' Em Ride, Caribbean Stud Poker, Spirit of the Inca, and Caribbean Hold'em Poker. RTG progressive jackpots can be worth over $1 million and the highest payout to date was in December 2017 when a lucky winner at Bovada Casino won $1,557,930 playing Jackpot Pinatas. The highest payout on the Megasaur progressive jackpot was in December 2016 when a lucky player scooped a massive $1,077,774. 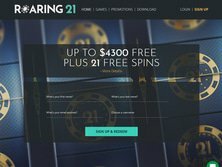 There isn't a dedicated winners page on the Roaring 21 Casino and as this gambling site is brand new there haven't been any big winners yet. When you visit the progressive jackpot section you can clearly see the current jackpot prize waiting to be won. Roaring21 Casino is a brand new online gambling site with excellent customer service and security protocols. Fair gaming is also guaranteed. As the casino is new there are no customer complaints to report and as such we are giving this online gambling site a 5 out of 5 rating. We will be monitoring any complaints that are lodged and how they are dealt with and we will adjust our rating if required. Casino Roaring21 opened its doors in 2018 and is licensed in Curacao using the master licence Gaming Services Provider. This is the sister casino to CasinoMax and Cherry Jackpot and if you've enjoyed these sites you will enjoy what Roaring 21 Casino has to offer. The site accepts all main payment methods including Bitcoin. The Roaring 21 Casino website is very easy to navigate and it loads very quickly. I was a little disappointed to find that this new site didn't offer a no deposit bonus voucher, but once I took a look at the welcome package and the huge selection of promotions available it didn't really matter. The Casino Roaring21 bonus for new players includes 21 free spins and up to $4,300 in bonus cash which was a great boost to my bankroll. There are plenty of payment methods to choose from and you can test out the games for free using the demo versions. I tested the games on both mobile and desktop and they ran perfectly in my browser without having to download any apps. Customer support was excellent too and there was a frequently asked questions section too. All in all, I had a very positive experience and the huge number of promos available every time I made a deposit was a huge plus. I can definitely recommend Roaring 21 Casino for any Canadian player looking for a new real money gambling site in 2018.